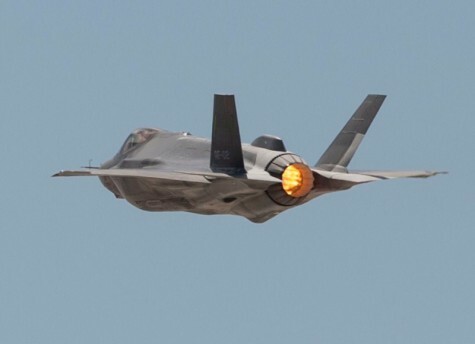 PARIS --- Lockheed Martin and the F-35 Joint Program Office (JPO) have manipulated publicly-released cost figures to artificially lower the unit cost of the F-35 fighter, which are in fact dropping far more slowly that claimed. The trick consists in claiming that unit costs now include the engine, whereas up until the Lot 10 contract, announced Feb. 3, unit cost figures specifically did not include the engine. By quietly adopting the new cost definition, the JPO and Lockheed artificially reduced the aircraft’s unit cost by $23 million – the approximate cost of a PW-135-100 engine – with a stroke of the pen. The LRIP 9 unit cost for an F-35A was $102.1 million not including the engine. This trick allowed JPO and Lockheed to claim that the Lot 10 aircraft unit cost (including the engine), had dropped to $94.6 million, or $7.5 million lower than the Lot 9 unit cost ($102.1 million) which did not include the engine. In other words, the cost of the engine disappeared, making the F-35 that much cheaper in the eyes of a gullible public, who takes these announcements at face value. This latest manipulation began with the Lot 10 contract, first announced by the JPO in a Feb 3, 2017 press release. The switch from engine-less to engine-included costs was missed by program observers, including this writer, and only came to light during a recent e-mail exchange with Lockheed Martin’s chief F-35 spokesman, Michael J. Rein. We asked Rein how the F-35’s cost – stated as $102.1 million in Lot 9 “not including the engine” – could drop to $85 million by FY2019. Voodoo accounting: Lot 10 unit costs include the engine, but are claimed to be $9 million lower than the Lot 9 cost, which did not. No explanation is provided. The Lot 10 statement lists unit costs “including jet, engine and fee,” but does not explain the change in presentation. It also makes no mention of the engine, while previous press releases always stated that “F-35 engines are funded through separate contract actions with Pratt & Whitney." It is not clear what has happened to these "separate contract actions with Pratt & Whitney." They presumably still exist, unless Pratt is now working for free, which is unlikely, but it is again unclear where they have been moved. JPO spokesman Joe DellaVedova, who was copied on Mike Rein’s e-mails asserting its costs included engine costs, did not react to the latter’s statements, and did not respond to our e-mail request for clarification. Here are the JPO press releases on F35 Lots 5 to 8. The releases for Lot 9 and Lot 10 are visible in the screen grabs above. The most surprising aspect of this manipulation is that it is rather pointless. Its only use is for public relations -- to show F-35 costs are falling fast when, in fact, they have decreased by just 10% over the past five years. The US government and foreign customers also use these unit costs to deflect criticism, but they all know they are paying far different – and far higher -- prices for their aircraft. For example, the latest unit cost for an F-35A is $154.8 million, according to the Pentagon Comptroller’s FY2018 report on Program Acquisition Costs by Weapons System. And our analysis of Lot 9 contracts, including all program costs including airframe, engine, components and post-delivery retrofit, upgrades and fixes, the unit cost of a Lot 9 aircraft is $206.3 million. Why the Sleight-of-Hand on Engine Costs? Likewise, the JPO's statement did not mention the engine, just the “air vehicle,” without saying what the term covers. Massaging the cost figures was necessary to meet the program’s long-standing promise to lower the F-35A’s unit cost to $85 million by FY 2019. The latest figures available, for FY2018, are for Lot 10 aircraft whose cost is stated as $94.6 million. But adding the cost of the engine increases cost to $117.6 million, which would then have to drop by an impossibly high 28% in one year to reach the FY2019 target of $85 million. “The price for FY 2018 will be well below this and we are still on target for an $85M or less F35A in 2019,” Lockheed spokesman Michael J. Rein said in a June 7 e-mail. In recent years, both the Joint Program Office and Lockheed Martin have shrugged off reports of cost overruns by claiming that unit cost of the main, F-35A version will drop to $85 million by FY 2019. More recently, Lockheed CEO Marillyn Hewson said during a Jan. 24 earnings call that “Lockheed Martin is on track to bring unit costs for an F-35A to $85 million in 2019,” Defense News reported. The program has been committed to delivering U.S. Air Force F-35A version aircraft in 2019 for $85 million, compared with the most recent negotiated price of $94.6 million, Aviation Week reported Lt. Gen. Christopher Bogdan, F-35 Program Executive, as telling reporters March 2 during the Avalon, Australia air show. -- Minor editing changes for style added 17:00 GMT on June 14.